The Senate President expressed his displeasure on Wednesday shortly after he had sworn-in Adeleke as the Senator representing Osun-West. 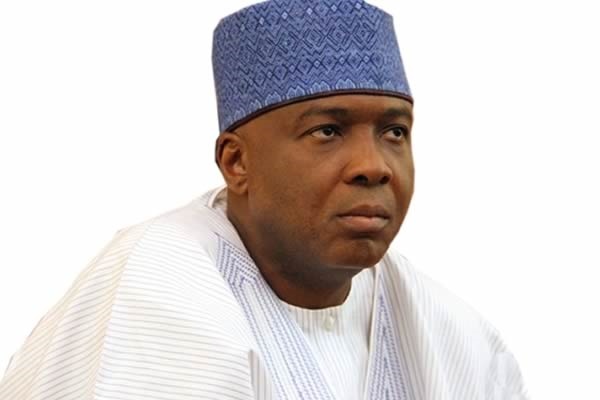 The Senate President, Bukola Saraki, has expressed his sadness over Ademola Adeleke’s victory at the Osun West senatorial district election on the platform of the Peoples Democratic Party. The Senate President made this known on Wednesday shortly after he had sworn-in Adeleke as the Senator representing Osun-West. Adeleke had defected from the All Progressives Congress to run as the opposition party’s flagbearer in last weekend’s by-election. In a Facebook post, Saraki said though he is happy with Adeleke’s victory, he, however, was sad that he was not coming in as an APC Senator. Saraki said Adeleke’s defection was caused by a mishandling of pre-election matters in the APC. He said it should serve as an eye-opener to the APC that the will of the people should always be respected. The Peoples Democratic Party (PDP) in Osun State pulled a surprise victory in the just-concluded Osun West Senatorial District election, winning nine out of the 10 local governments in the district. Its candidate, Ademola Adeleke, who rode on the people’s sentiments for his late brother Isiaka Adeleke, defeated his APC opponent, Mudashiru Hussein, polling a total of 97, 280 votes. Hussein came a distant second with a total of 66, 115 votes.